We review nonlinear optical processes that are specific to chiral molecules in solution and on surfaces. In contrast to conventional natural optical activity phenomena, which depend linearly on the electric field strength of the optical field, we discuss how optical processes that are nonlinear (quadratic, cubic, and quartic) functions of the electromagnetic field strength may probe optically active centers and chiral vibrations. We show that nonlinear techniques open entirely new ways of exploring chirality in chemical and biological systems: The cubic processes give rise to nonlinear circular dichroism and nonlinear optical rotation and make it possible to observe dynamic chiral processes at ultrafast time scales. 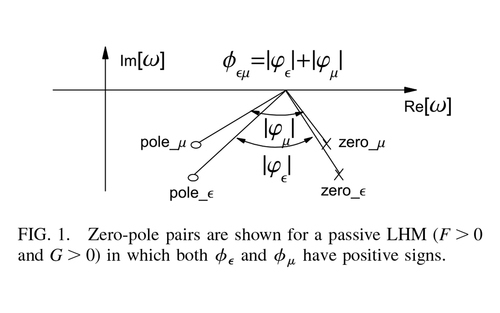 The quadratic second-harmonic and sum-frequency-generation phenomena and the quartic processes may arise entirely in the electric-dipole approximation and do not require the use of circularly polarized light to detect chirality: They provide surface selectivity and their observables can be relatively much larger than in linear optical activity. These processes also give rise to the generation of light at a new color, and in liquids this frequency conversion only occurs if the solution is optically active. 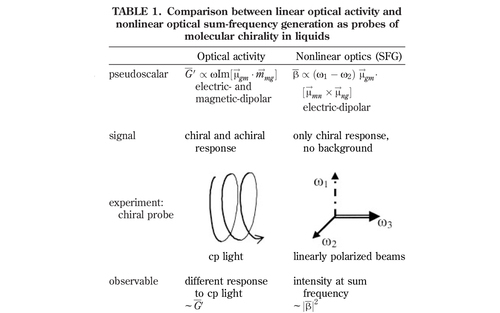 We survey recent chiral nonlinear optical experiments and give examples of their application to problems of biophysical interest. (C) 2005 Wiley-Liss, Inc. There is significant motivation to develop media with negative refractive indices at optical frequencies, but efforts in this direction are hampered by the weakness of the magnetic response at such frequencies. We show theoretically that a nonmagnetic medium with two atomic or molecular constituents can exhibit a negative refractive index. A negative index is possible even when the real parts of both the permittivity and permeability are positive. This surprising result provides a route to isotropic negative-index media at optical frequencies.